May 21, 2011 came and went, and the world as we know it did not end, despite the prophecies of some demented preacher. For those extreme music inclined, yet disappointed in the lack of this monumental event, Moribund Cult has gone out and reissued the eponymous debut of Mortualia, a one-man depressive black metal outfit of Shatraug, well-known in black metal circles for his spearheading Horna and Sargeist among numerous others. Mortualia, the album, would have been suitable music for the end of the world, and whatever was left thereafter, because with this opus Shatraug presented some of the most depressing black metal one can produce. 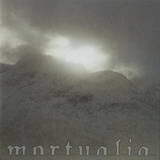 Extremely lo-fi, call it bedroom BM to the core, the music on Mortualia is an ebb and flow of overdistorted guitars, barely audible drums and at times surprisingly active bass (the opener The Blue Silence). All of the music revolves around simplistic repeating melodies capable of driving you insane. To top it all off, the vocals are the purest in raw emotions as well, horrid screams comparable only to what I have heard Nattramn do with Silencer on Death – Pierce Me (and that man ended up being institutionalized as we know). Unlike another depressive cold Finnish act October Falls, Mortualia has less melody to immediately latch on to. The music here is far from romantic and at times is downright doomy (Forgotten Soul). Whereas Devoid of Warmth is still mournful and elegiac, it can be called remotely melodic. On the other hand, In Bleak Loneliness uses melody to draw you in, only to saw you sideways soon thereafter. I can’t deny the fact that I often listen to depressive music to help me cleanse myself of downtrodden thoughts. Mortualia can’t be recommended for such purpose as this one may lead you to actually cut your veins. Listening to this album is only suggested if you have a ton of time on your hands, so that you can truly abstract yourself from everything, to let it all go. The end result, however, may lead for your depression to worsen, so proceed with caution. And if original 70 min of this bleakness was not enough, the reissue contains another 10 min or so Death Serenity track.